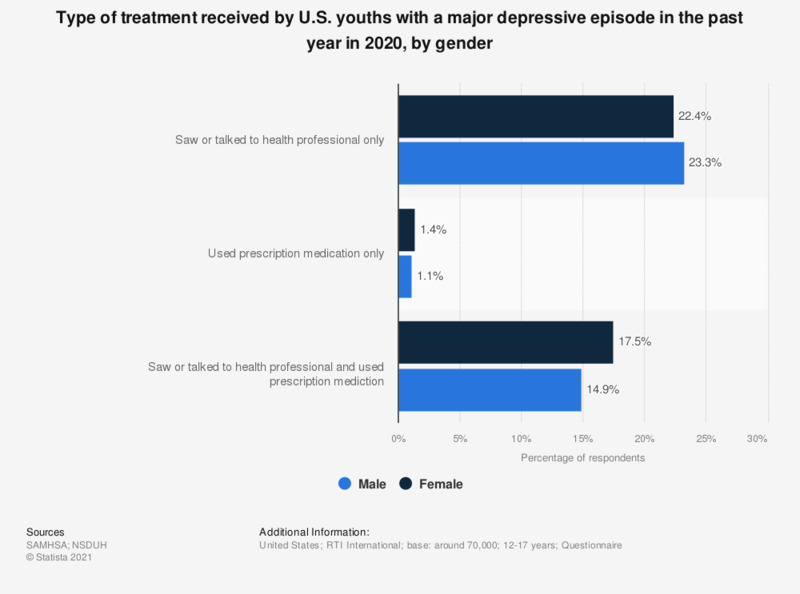 This statistic represents the type of treatment received by US youths with a major depressive episode in the past year as of 2017, by gender. As of that year, some 3.2 percent of male respondents and 2.1 percent of female respondents with a major depressive episode in the past year stated that they had used prescription medication only. Health Professionals include general practitioner or family doctor; other medical doctor (e.g., cardiologist, gynecologist, urologist); psychologist; psychiatrist or psychotherapist; social worker; counselor; other mental health professional (e.g., mental health nurse or other therapist where type is not specified); and nurse, occupational therapist, or other health professional.